Do you remember at the end of Back to the Future, where Doc Brown tossed a banana peel, some egg shells, and a partially-consumed beer into "Mr. Fusion" to make the DeLorean time machine fly? 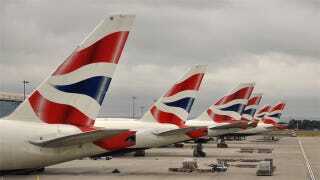 Now, in the present, British Airways has announced its "GreenSky" project will convert solid waste into jet fuel. Washington D.C-based Solena fuels will use a proprietary technology called plasma gasification to convert the waste to gas. Then, it will use a chemical conversion process called Fischer-Tropsch to then convert the gas into jet fuel. The solid waste, or "rubbish" as they say in England, will actually be diverted from a final fate in a landfill, making it a benefit not just to the airline, but the environment as well. The plan is to convert 551,000 tons of waste into 16 million gallons of jet fuel annually, making every British Airways flight from London City Airport carbon neutral. "We are always striving to reduce our impact on climate change and this first-of-its-kind project marks a significant step for the aviation industry. The construction of the GreenSky London fuel facility at Thames Enterprise Park will lay the foundations for British Airways to reduce its carbon emissions significantly. The sustainable jet fuel produced each year will be enough to power our flights from London City Airport twice over with carbon savings the equivalent of taking 150,000 cars off the road." The plant offers lifecycle greenhouse gas savings of up to 95 percent compared to fossil-fuel derived jet kerosene. The project will reduce the volume of waste sent to landfill. The only solid waste product is an inert vitrified slag material, which can be used as an alternative to aggregates used in construction. Tail gas can be used to produce 20MW of excess electricity for export to the national grid or converted into steam to be used in a district heating system. Searching for money-saving alternatives to pricey jet fuel is something the industry has been doing for the past several years as oil prices have been steadily high. Jet fuel costs now make up 30-40 percent of the budget for many airlines. Recently, Air New Zealand, Lufthansa, and Virgin Atlantic have run trials using algae-based fuels. Delta Air Lines decided to keep it old school in 2012 when bought its own oil refinery near Philadelphia, in an effort to influence the price of oil.